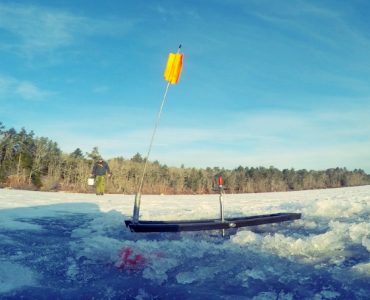 Tip up ice fishing has a bad rap as a lazy method of fishing. Sure, it can be fun to watch the tips ups from the comfort of your shanty, but it’s also a great method for covering water. After all, success on the ice is earned through hard work, not by following the herd of anglers all watching each other. To find untapped fish, you need to cover water, and these 10 tip-up tips and strategies can help you do it. 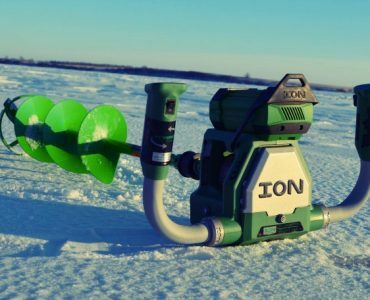 Ice anglers need to be utilizing the amazing fish finder technology available nowadays. A combo unit with sonar and GPS mapping is an extremely important tool to have and utilize. Use the GPS with contoured lake maps to find the best structures likely to be holding fish. The use the sonar to locate the weed beds, weed edges, break lines, points, and reefs. Learning to utilize your flasher and sonar will increase your ability to get your tip up holes over the sweet spots on the structure. Using a grid or diamond pattern can be a super effective way of covering water. 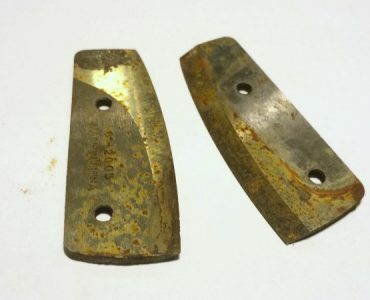 Drill four holes with your auger in a diamond shape, approximately 30-40 yards across. In the center for a tip up. If the local laws allow it, you can drill multiple diamonds to form a grid. Then place a tip up in each center hole, and methodically work your way down the grid with your jigging setups. This strategy allows you to call in feeding fish with your jigging lures, and if they don’t bite, the tip up is there as a subtle clean up offering. This method works extremely well for walleye and pike. Don’t expect your tip ups to be totally set and forget. Live bait can tangle up, especially in heavier weed beds. It’s good practice to periodically check your lines to make sure your bait is lively, and you line hasn’t fowled up in the weeds. Tip ups aren’t much good if you can’t see the flag go up. Align your tip ups so that the flag will be easily visible to you in the shelter. Another great idea is to attach LED lights to the flag pole, especially at dusk and dawn when visibility is lowest. If your tip up didn’t come with lights, no worries as an LED flag light is a cheap add on. The pro thermal style tip up is gaining in popularity over the traditional wood plank variety. Not only do they cover and insulate the entire hole and prevent most ice overs, but they have built in tackle compartments and many have LED lights built in. The best tip ups are insulated and they still will be in the future. If you aren’t yet a convert, it’s about time to give them a try. Happy Hour is the magical window of time right before and after dusk when fish become more active and feed. This is especially true for walleye, most ice anglers favorite fish to target. Get your holes setup well in advance of the Happy Hour. Rushing around drilling tip up hole is a perfect way to miss out on the magic hour bite. Tip up ice fishing line is made up of heavy, highly visible Dacron fibers, and easily visible to fish expect in the murkiest of waters. 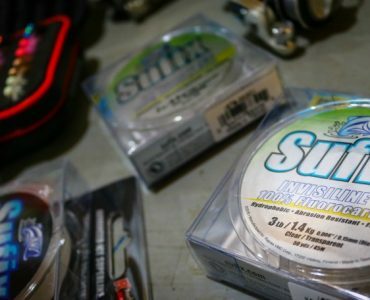 Tying a fluorocarbon leader will get you more bites, guaranteed. Don’t be worried about break offs from sharp teeth, fluorocarbon is tough and abrasion resistant. Cut 8 to 10 feet of 10-15lb fluorocarbon, then tie a swivel to one end. Then tie a Palomar knot from the tip up line to the swivel. Even spooky fish will have a hard time seeing your line, resulting in more bites and more iced fish. Experienced ice anglers know to downsize their treble hooks to get more bites. Fish can inspect your bait as they please on a tip up, and they probably aren’t going to bite with a huge treble hook staring them in the face. For Walleye, you can get away with treble hooks as small as #10 or even down to #16 with smaller minnows and shiners. Only go up to #8 or more with larger live bait like sucker minnows. Hooks should be larger for Pike, like a #6 or #8. The exception would be if you are on trophy Pike waters, upgrading to #4 can be a good idea. 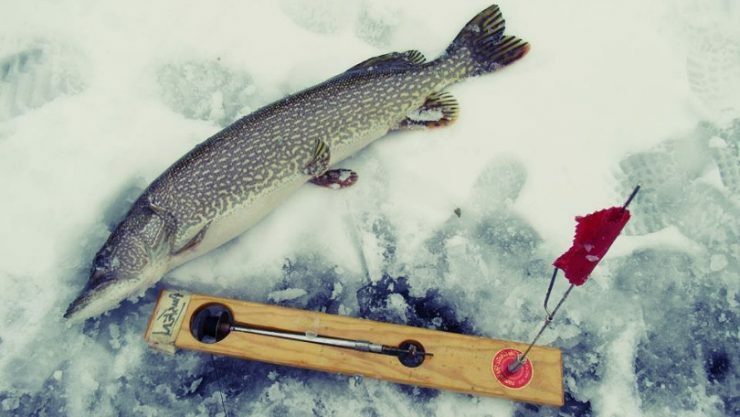 Tip up ice fishing requires a different hook set than on a regular ice rod and reel. After sprinting to your flag, the temptation is to pull in all the slack and wrench hard right away. Resist this urge and learn to feel the movement of the fish swimming away with the bait. It’s time to lean on them only once you can sense the weight of the fish. Getting good at this results in more corner mouth hook penetration where sharp teeth can’t saw off your line. If you have trouble setting the hook on single treble bait rigs, try a Quick Strike rig. These two and three hook rigs can make your hookup success rate soar, especially with big pike. The advantage is being able to pull on a fish as soon as you can get to your hole. You can fish a Quickstrike rig with live or dead bait, placing one hook toward the tail, and the other above the dorsal fin.